With our text and data bundle add-ons, we offer you even greater value allowing you to use your phone how you want. If you are a prepay customer, the cost of the bundle will be simply deducted from your credit every 28 days. If you are a bill pay customer, add-ons are recurring and the cost is simply added to your monthly bill. You can choose from one of our once off Add-ons. They’re great value starting from just 79c for 24 hours. Web pages and emails vary in size depending on text and graphics included. 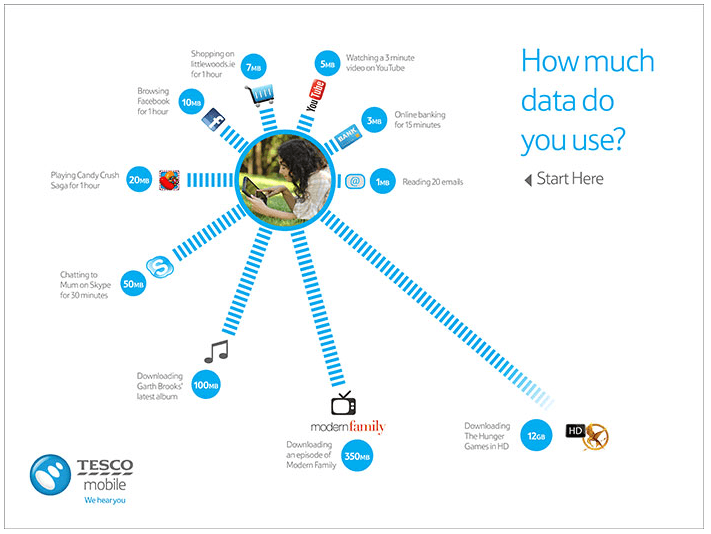 The information below displays typical data usage. You can check how much data is remaining in your bundle by dialling *100*6# and press the call button or by logging onto My Tesco Mobile, or our app for Android and iPhone. Your Add-on is active from the next data session initiated on your phone. If you have an existing active data session (e.g. a YouTube video running or file download) when you purchase the Add-on, these may continue to be charged at the outside bundle rates until the session is complete. To ensure your data usage is covered by your Add-on immediately, it is recommended that you stop all active sessions as soon as you purchase the Add-on. This can be achieved by putting your phone to airplane mode and back or by restarting your phone. Your data add-on cannot be used to purchase content (Ringtones, Games etc), however the data used to download the content is included. You will need extra credit on your account for any other call types or services. For use in the Republic of Ireland only. Fair usage policy applies. * Sending any message (even blank) to 174209, 174210 or 174211 will automatically deduct the cost of that bundle from your balance, so please don't text these numbers unless you're ready to buy. If you purchase a new data once off Add-on before an existing once off data Add-on has expired, both the remaining data allowance and expiry date are extended by the new data Add-on purchase e.g. if you have 10 days and 500MB left from your initial 28 day Add-on when you purchase a new 28 day data Add-on you will now have 38 days of data usage with a 1524MB data allowance. If you have a recurring data bundle add-on, you may purchase a once off data bundle as well. However the expiry date for this new add-on will be the same as that of the original recurring data add-on. A fair usage limit of 5,000 texts per month applies to the Unlimited Text Add-on. This excludes premium rate messages, international text, any text messages sent whilst roaming or to any other non-geographic numbers. €5.00 is charged every 28 days, and will be deducted from your credit. You can opt out by texting OPTOUT DATA to 1744. This add-on includes internet browsing and data on the home network for 28 days. A limit of 1GB applies. Chargeable content, such as ringtones or games, are not included in the allowance, however download of the content is included. If you do not have enough credit to pay for the bundle, we will try again daily for 5 days before unsubscribing from the bundle. Please note that add-ons are pro-rated i.e. you will receive a prorated allowance and charge from the date of opt-in to your next billing date. The proration is applied only for the first month for Bill pay customers, until it aligns with the customer’s monthly billing cycle. See add-on terms for further information. €10.00 is charged every 28 days, and will be deducted from your credit. This add-on includes internet browsing and data on the home network for 28 days. A limit of 5GB applies. Chargeable content, such as ringtones or games, are not included in the allowance, however download of the content is included. €10.00 is charged every 28 days and will be deducted from your credit. You can opt out by Texting OPTOUT TEXT to 1744. Your text add-on can be used for texts to any mobile network within the Republic of Ireland. A fair usage policy of 5,000 texts applies. Texts sent while outside of Ireland or to international numbers are charged at normal rates. Standard rates apply if you exceed the inclusive fair usage monthly allowance of 5,000 texts. €5.00 is charged in exchange for 100 texts for 28 days and will be deducted from your credit. Your text add-on can be used for texts to any mobile network within the Republic of Ireland. Texts sent while outside of Ireland or to international numbers are charged at normal rates. Standard rates apply if you exceed the allowance of 100 texts. If you do not have enough credit to pay for the bundle, it will not be applied. The €0.79 is a once off charge, and will be deducted from your credit. This add on includes internet browsing and data on the home network for 24 hours. A limit of 50MB applies. Chargeable content, such as ringtones or games, are not included in the allowance, however, download of the content is included. Standard rates of 10c/MB apply if you exceed the 50MB allowance. The €2.99 is a once off charge, and will be deducted from your credit. This add on includes internet browsing and data on the home network for 7 days. A limit of 350MB applies. Chargeable content, such as ringtones or games, are not included in the allowance, however, download of the content is included. Standard rates of 10c/MB apply if you exceed the 350MB allowance. €5.00 is charged every 28 days (until 9th May and every 28 days thereafter) and will be deducted from your credit. Your 1GB data bundle can be used for internet browsing and all data used in the Republic of Ireland. Standard rates of 10c/MB apply if you exceed the monthly 1GB allowance. €10.00 is charged every 28 days (until 9th May and every 28 days thereafter) and will be deducted from your credit. Your 5GB data bundle can be used for internet browsing and all data used in the Republic of Ireland. Standard rates of 10c/MB apply if you exceed the monthly 5GB allowance.